TAZO’s BLACK TEA – AWAKE is the type of tea Starbucks uses in their concentrate. It’s no secret that I love my black tea from Starbucks. But since I live in the middle of no-where, Starbucks isn’t always an option. 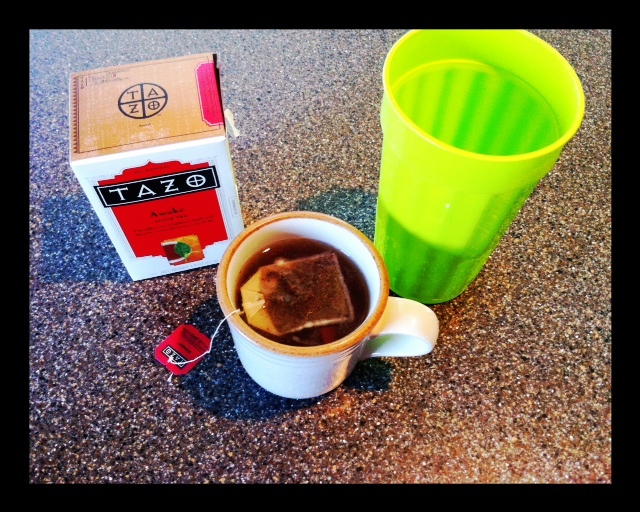 Enter… TAZO tea at home. It’s not in the pretty TRENTA sized cup, and yes – I had to make it. But it works in a pinch – and it tastes great! I put my coffee mugs in the microwave for 1 minute – steep for about 2-3 minutes, and pour over ice. Fill the rest with water and wa-lah! There lots of quoted benefits for drinking black tea… and for me, it beats any other alternative out there. It’s full of antioxidants, helps to boost my metabolism and it’s not killing me, like soda. On a whim I tried some green tea last week when the lady at Starbucks accidentally made my drink wrong… and… well…. What is YOUR favorite drink – other than WATER of course? Posted on June 28, 2012, in Diet, Food To Try, Metabolism, Our Struggles and tagged Black Tea, Black Tea at Home, healthy for God, healthy for him, Starbucks Tea, Tazo Awake Tea, Tazo Tea. Bookmark the permalink. Leave a comment.